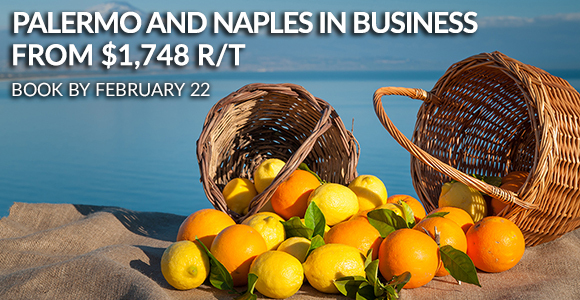 Right now you can purchase business class on Alitalia by 2-22-17 and get a great deal on Alitalia between New York and Naples or Palermo from $1,748 roundtrip in business class. This is a really good deal. This is about the cost of premium economuy. There are a lot of cheap fares to Europe right now but those are mostly all in regular economy. Not really the same experience in my opinion. This is available for bookings from April to October. This is only for certain days of the week so you’ll have to check. A couple sample dates I found are 5-5-17 to 5-9-17 and 5-19-17 to 5-20-17. Search JFK-NAP or JFK-PMO on Google Flights and then select the price graph for easy searching. It looks like most of the flights connect in either Milan MXP/LIN or in Rome FCO. I would try to avoid the MXP/LIN route if you don’t want to change airports there. You might be able to build in a long layover and see some of Milan however. * Fares are round-trip per person in Business Class for travel on Alitalia flights and include government taxes/fees and carrier-imposed charges. Tickets must be purchased by February 22, 201711:59 PM EST. Travel periods: from New York to Naples from April 12 to October 28, 2017; from New York to Palermo from April 11 to October 27, 2017.Fares is applicable only for specific days of week for outbound and inbound. Additional conditions regarding travel dates, day-of-week restrictions and child/infant conditions may apply. Day of the week surcharges may apply. Changes fees may apply. Tickets may be non-refundable. Stopovers may not be permitted. Transfers may not be permitted. Fares are subject to class of service availability and may be changed or withdrawn without notice. Additional baggage fees may apply. In addition you can join the Alitalia Millemiglia program however I personally would rather credit these to other Skyteam members that have better expiration policies. If you want to join the Millemiglia Program however you can get a signup bonus right now of 2,000 miles using this link: Alitalia Millemiglia . This trip should earn you about 8,600’ish miles roundtrip. Business class on Alitalia features access to the Skyteam lounges, priority gate access, free bags, 180 degree lay flat seats on mostly new A330’s. They have been featuring Bulgari amenity kit’s and have highly rated cuisine. I don’t not get any benefit from any of these links. This is just a good deal I found.